Language is one of our most precious and uniquely human capacities, so it is not surprising that research on its neural substrates has been advancing quite rapidly in recent years. Until now, however, there has not been a single introductory textbook that focuses specifically on this topic. Cognitive Neuroscience of Language fills that gap by providing an up-to-date, wide-ranging, and pedagogically practical survey of the most important developments in the field. It guides students through all of the major areas of investigation, beginning with fundamental aspects of brain structure and function, and then proceeding to cover aphasia syndromes, the perception and production of speech, the processing of language in written and signed modalities, the meanings of words, and the formulation and comprehension of complex expressions, including grammatically inflected words, complete sentences, and entire stories. Drawing heavily on prominent theoretical models, the core chapters illustrate how such frameworks are supported, and sometimes challenged, by experiments employing diverse brain mapping techniques. Although much of the content is inherently challenging and intended primarily for graduate or upper-level undergraduate students, it requires no previous knowledge of either neuroscience or linguistics, defining technical terms and explaining important principles from both disciplines along the way. 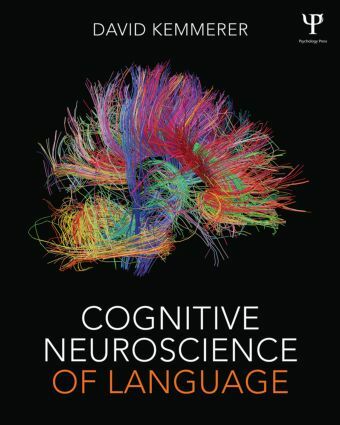 "This is a very interesting new book on the Cognitive Neuroscience of Language. I recommend it for students and established researchers alike". "This textbook stands out in covering a wide breadth of topics while also providing adequate depth for students in my Introduction to Neurolinguistics course to engage with the ongoing debates and most recent theoretical developments in the field." "David Kemmerer's Cognitive Neuroscien of Language is a superb textbook on the relation between language and the human brain … but it will, I suspect, also become the standard work for all those researchers who wish to have a masterly overview–both broad and deep–of aphasia and neurolinguistics to frame the focus of their own research." Part 1: Fundamentals. The Human Brain. Brain Mapping Methods. Part 2: Aphasia. Classic Aphasia Syndromes. Primary Progressive Aphasia Syndromes. Part 3: The Perception and Production of Speech. Speech Perception. Speech Production. Prosody. Part 4: Other Modalities of Language Use. Reading and Writing. Sign Language. Part 5: The Meaning of Words. Object Nouns. Action Verbs. Abstract Words. Part 6: Morphology, Syntax, and Discourse. Morphology. Sentence Production. Sentence Comprehension. Discourse. David Kemmerer is a professor with a joint appointment in the Department of Speech, Language, and Hearing Sciences and the Department of Psychological Sciences at Purdue University. He is also an affiliate of the Interdepartmental Linguistics Program at Purdue. In addition, he has an adjunct appointment in the Division of Behavioral Neurology and Cognitive Neuroscience at the University of Iowa, where he worked as a postdoctoral fellow before becoming a faculty member at Purdue. He has taught courses on the neural bases of speech and language, the broader field of cognitive neuroscience, and diverse topics in linguistics. Professor Kemmerer’s research focuses on how different kinds of linguistic meaning are mediated by different neural systems, drawing on behavioral and lesion data from brain-damaged patients as well as behavioral, electrophysiological, and functional neuroimaging data from healthy subjects. He has published over 40 journal articles and book chapters describing various aspects of his research.